'De Hoedenmaker,' is an exceptional beautiful holiday house. It is located in the heart of Bruges. The facade is built in the traditional step-gable style that is typical of the finest Flemish houses. It is a charming and elegance house built in 1675. Located in the peaceful and quiet area of Saint Gilles quarter, about 400m north of the medieval port of the city and only a 10 minutes' walk to the Market Square and the Belfry tower. 'De Hoedenmaker' is a three-level house with a total of 110 square meters living area, completely renovated in 2003 and refurbisched in 2017. New bathroom in 2019. The kitchen includes a full complement of cooking utensils and cutlery. One the 1st floor there are 2 separate bedrooms with a Queen bed in each. One of the Queens can be separated in two beds if necessary. On the 2nd floor, in connection with the master bedroom, there is a twin bed (full size single beds for adults). On the 1st floor there is a full bathroom and second toilet on the ground floor. Central heating. The house faces south and takes in plenty of sun year round. It also has a private walled-in terrrace and laundry room. In the living room you'll find cableTV, DVD, books, ... Fast WiFi is available for free. NETFLIX availalbe if you are a member. Guests who want to visit Bruges will enjoy the wonderful atmosphere of the city. 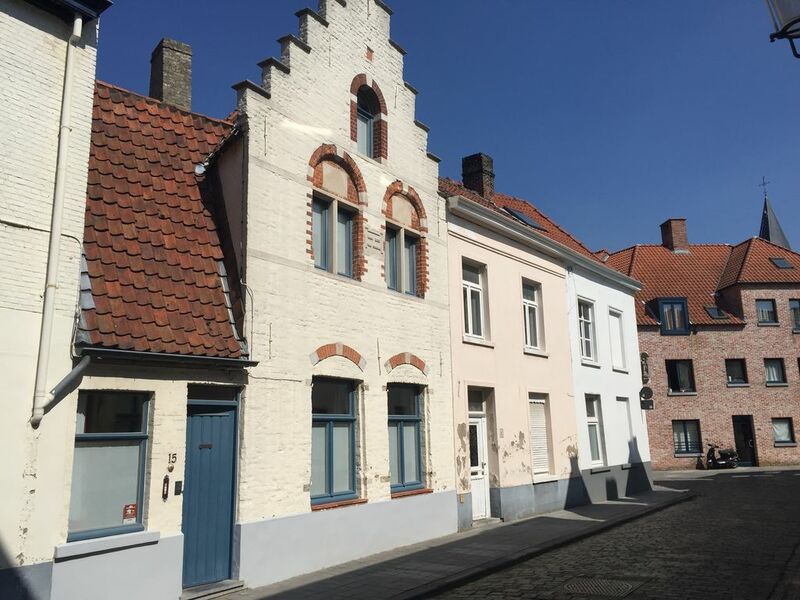 The house is situated in a very quiet historic part of Bruges. You will love this relaxing resort and immediately feel at home. Guests who want to visit Bruges will enjoy the wonderful atmosphere of the city. Nearest recommended restaurant at 50 m: “Tom’s Dinner”. Touristical leaflets on Bruges and its surroundings are available. Free parking just outside city center or near train station (3.50/day). Free shuttle to your house (350m). We wish you a pleasant stay in a magnificent Bruges! Pascal and Greet are married and live in Bruges ever since they were born. We have five children, all grown up already. Professionaly we are both active in education. We are happy to make you feel at home. toilet, Toilet downstairs has been renovated in 2018.
toilet, shower, New bathroom, renovated in 2019. About 20 km from the Norhtsea beach. Easily accessible by car, bus or train. Recieving incoming calls possible. Emergency call possible. Central heating system. The temperature can be set in each space. Seats for every guest. Reading chair. Touristical information at your disposal. Writing desk. Over 100 TV- and RADIO-channels in different languages. Some DVD's available. You can bring your own. Log on to NETFLIX with your own account (bring along username and password). Books available in different languages. Some toys for the little ones availble. Cosy place to have breakfast or to sit outside till late in the evening. Wonderful for two couples or a family! We are two couples who enjoyed a fabulous week in this beautiful Brugge house! Pascal gave us great information upon arrival, and we enjoyed breakfast together and roaming every day. Dinners out were wonderful—great location and close to Market Square. You won’t regret staying at this beautiful home! Thanks for the + review! Fantastic property and would book again! Great location - about 10 minutes walking distance from City Centre. The neighborhood is nice and quiet; the property is cozy and comfortable - the beds were amazing! Pascal is a gracious host and very easy to work with - if I ever head back to Bruges, would book this property again. Thanks for the + review Patti. Located in Bruges, Flanders, western Belgium. Nearby the medieval port of the city. Just 15-20 km from the Northsea.